Tunisia is officially called the Tunisian Republic and is a country in North Africa. It has a coastline on the Mediterranean Sea, just south of Italy. What you should know first is that you should not get close to the border between Tunisia and Libya due to reports of violence. Other regions are perfectly safe. It is a pity that tourism in Tunisia has been neglected for many years because it is a beautiful country with plenty to offer. There are many historical and archaeological sites that you can enjoy. Other than that, do not forget about the beaches on the Mediterranean Sea. In the summer, you can sit in the sun while you enjoy a cold drink. Tunisia also has desert, so you may be interested in trekking through it as well. Before you leave for Tunisia, you need to see if you need a visa or not. Fortunately, the visa policy of Tunisia is pretty lenient, and chances are that you do not. For one thing, the citizens of 97 countries and territories can enter Tunisia visa-free and stay for up to 90 days unless otherwise noted. Furthermore, the citizens of 8 countries can enter Tunisia without a visa, but only if they travel on an organized tour, and they hold a hotel voucher. All the other nationalities must visit the nearest diplomatic mission of Tunisia and apply for a visa. To find out in which category of travelers you are, you can consult Tunisia’s visa policy yourself. However, we believe that using iVisa’s Visa Checker is far more convenient. It is a simple tool that tells you what you need to know in just a few clicks. First, you need to access the feature by clicking on the Visa Checker in the top right corner of this page. Then, you must select your country of origin from the drag-down menu on the left and add Tunisia in the box on the right. The result will tell you if you need a Tunisia visa, and if you do, you will be provided a list of the nearest embassies. Unfortunately, iVisa does not process Tunisia visa applications for the moment, but we would still like to help you in any way that we can. As a result, we put at your disposal our customer support. The service is available 24/7, and it is entirely free of charge. 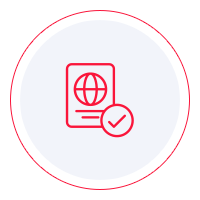 If you find out that you need a Tunisia visa, you need to learn about the visa requirements. You have the option of doing your research online, but we recommend caution. That is because the information you find online is not always the most reliable. As an alternative, we advise you to call the issuing authority and ask about the requirements. It is the most legitimate source of information. In the meantime, what we can tell you is that all applicants must have a valid passport that does not expire for at least another 6 months from the date of arrival in Tunisia. We regret that we cannot help you further to get your Tunisia visa, and we hope the information above is helpful and that you have a smooth visa application process at the diplomatic mission of Tunisia.